Night clubs в Rechica – адреса и телефоны, карта проезда. Nothing was found in Rechica. Try to find it 500-km nearby. Review Was this Saturday at a party. Very pleased with the system all inclusive. You can just relax and have fun. Also nice girls in the hall. Create the right atmosphere. Thanks to the club for a bright night! Review She celebrated her birthday in this restaurant. I liked the restaurant at first sight. Beautiful interior, pleasant stay. In addition, it is convenient to get, not far from the subway =) Loved the kitchen. Polite staff. The waiter was surrounded by care and attention. After visiting this restaurant only good impressions remained. I think the next dr will meet here! Review A cozy bar with a good program on weekends. But the biggest advantage is the staff. Always greeted with a smile, I come as a visit to friends. Thanks to the waiters Catherine and Denis for the positive. Review Rested with friends last week in this club! I liked everything, probably the best place to rest on a weekday, as wherever we were in the city was empty, and here the atmosphere and the number of people were very pleased) Let's come some more! 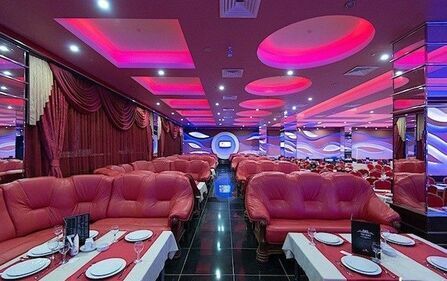 Review Karaoke club claims to be the best in Minsk. But I would not say that. The only value would be called only the interior. Food is the most common. Only the price is above average. The girl who meets at the entrance (apparently the administrator) can not give an adequate answer to the questions asked. I would also like to mention backing vocalists))) who not only sing (there are no questions to singing), but also dance))) this is complete thrash. Dancing at the level of school amateur. Comrades, you are the "best" in Minsk, well, try to keep the brand. And the most important thing is karaoke itself, for the sake of which you go there. Be prepared for the fact that you will not have such an opportunity, as they sing only VIP tables. Review Great, great place !! They came with friends to celebrate the birthday, I liked everything very much! Special thanks for the live music and the host !!! Great, guys are great! I advise everyone to this place. It will be hot! Review Very cozy place) delicious food, relaxing atmosphere, friendly staff) special thanks to the chef for the great Fondant! Review My husband and I often go to this bar. Everything is great. The bartenders are wonderful smiling boys. Service is good. The food is delicious. Everything is always good and fun. I like it very much. Review We walk in Doodah constantly and every time the feeling that I came to visit old friends: a cozy atmosphere, everyone is very friendly, cool music and food. Just what is so lacking in the daily routine. I liked it very much that they are no longer allowed to smoke. Thanks a lot to the administrator and the waiters! Review We went to Dozari with friends, to be honest, the situation begins to be better, remembering our trips last year, we concluded that the club seemed to “come back” is very nice! Special thanks to the guards who helped find the phone. Review We are in the club right now, it's hard to call it karaoke. Leading no, the breaks between songs are big, until you wait for your turn, morning will come. Prices compared to other clubs are high. Unfortunately, in other clubs the places were occupied, so you had to come here, it was free here. If you wanted to sing, then this club is not for you, because at night, at best, you will have time to sing 3-4 songs. Review Were with friends on the weekend. Loved it. Nice prices, quiet and comfortable. Review The impression is terrible! We decided to mark the birthday here, ordered a table in advance and food at 23.00, guests came to the end, did not give a hot offer and argued that we didn’t order anything, the service is terrible, the waitress did not differ in courtesy, brought food only at 1.40 and the microphones did not work. P.S. Thanks for the spoiled holiday. Never in my life will we return. Review Cool. Loved the atmosphere. We got with friends, in my opinion, on one of the best cover bends in the republic: danced, sang a lot. I like the interior. Delicious cuisine. It was before this half a year ago, so this time I was surprised at the presence of a hookah, I, as an amateur, could not refuse at the level. Thank you guys for a nice evening. Review Live music class !! Karaoke moves very slowly !! Breaks between songs 15 minutes !!! Review I liked everything, the staff was cheerful and energizing, the lead fellow was all fun, the cocktails were delicious, the fire served the drinks, in general, we liked everything more than once.